I have a Michael Kors watch that I bought at my first NAS five years ago. I wore it every day for years. The leather band really took a beating, and since I like my clothes and accessories to look very polished, I stopped wearing it as much. But I still really love the watch. 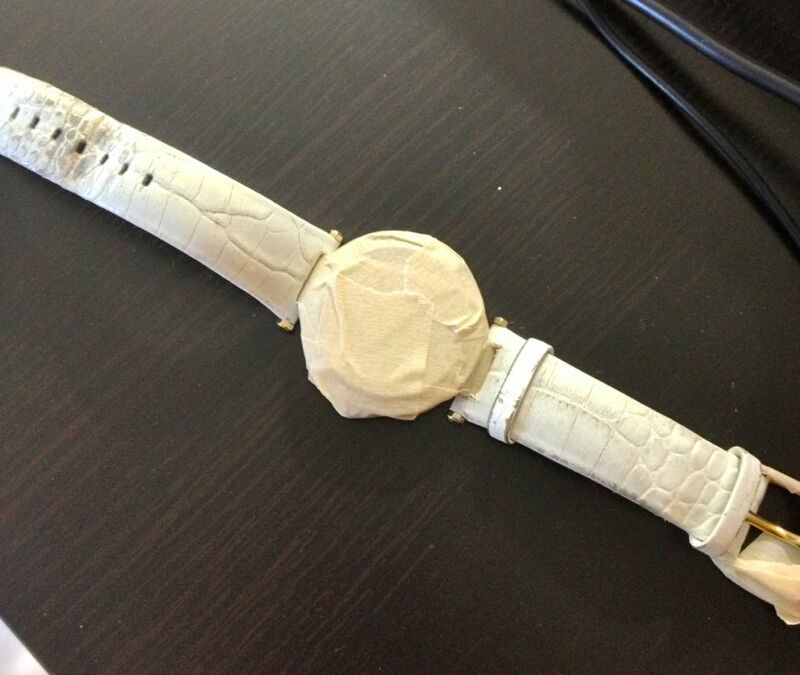 When I inquired about buying a new strap, I found out that MK watches can only be replaced with MK brand straps. It turn out that replacement straps are hard to find (Nordstrom only carries a few), expensive (over $100), and I'd probably have to send my watch away to Michael Kors for them to do the replacement. What a hassle! A while ago, Rae and Claire posted about dying leather handbags and shoes themselves and I thought maybe I could spruce up my strap myself. I ordered a white leather dye kit off Amazon. The band had split in a few places, so I started by repairing that with rubber cement. Then I masked off the metal bits (by far the most time consuming part) and followed the direction on the kit. It couldn't have been easier! The dye is very forgiving. I used two coats, and I'm really happy with how it turned out. And it only cost me about $25 in materials and 45 minutes of time. I think this repair will get me through the next few years, until the watch needs replacing completely. Photo 1: Before dying. You can see where the white dye had rubbed away in several places. Travel Capsule for UK Summer Trip? I know the weather can differ quite a lot between northern and southern England, and that the weather can vary a lot even during the course of one day. Also, Londoners wear a lot of black (is that true?). I don't own anything black. :( If anyone can give me any more guidance, that would be great. I live in Texas, so "hot" weather to me means anything above 90. I used Pinterest to put together a potential travel capsule, but I'd love some feedback from YLFers who are in England or have visited during the summer. My goal is to take 3 bottoms, 3 shirts, 3 "toppers" (layering pieces), 1 dress, 3 pairs of comfortable walking shoes, my trenchcoat, umbrella and 1 handbag, plus a few small accessories. That makes 7 outfits that I plan to wear twice each (we'll be able to do laundry while there). The hitch is I do not want to buy anything new just to take to England, especially things that I would never wear here in Texas. The trip is going to be quite expensive, and we just don't have much to spare for clothes. The items below are all things I already own (or close approximations). Here's my Travel Pinterest board if you're interested in seeing the actual items I have. It's been very hot this week (today is 104). I had lunch with some friends on Labor Day, and then we went shopping. It was at a nice, outdoor mall, so I knew we'd be in and out of shops a lot. 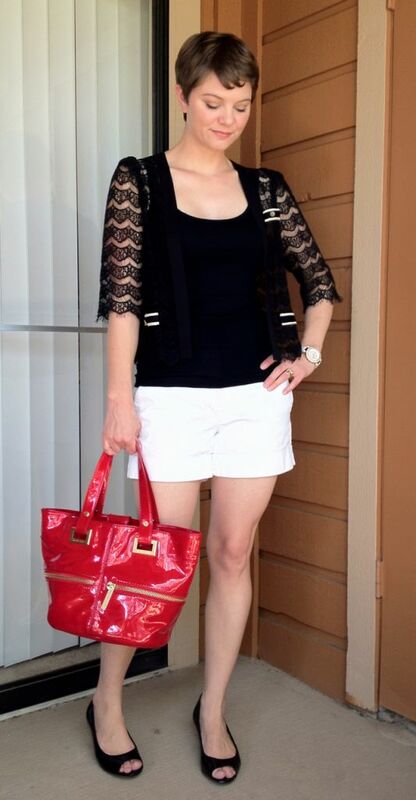 I got this boxy, cropped, lace jacket in June, and I have worn it a ton. The jacket keeps me cool outside, but warmer when we're inside. It's like a magic jacket! 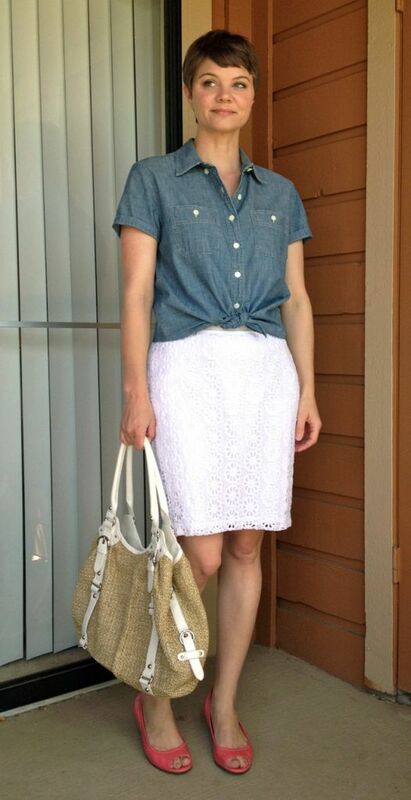 This is another of my "go-to" summer outfits and I wear it the same way every time. Suggestions for other ways to wear the jacket would be great! So far, I've only worn it over a black tank top. Thank you! 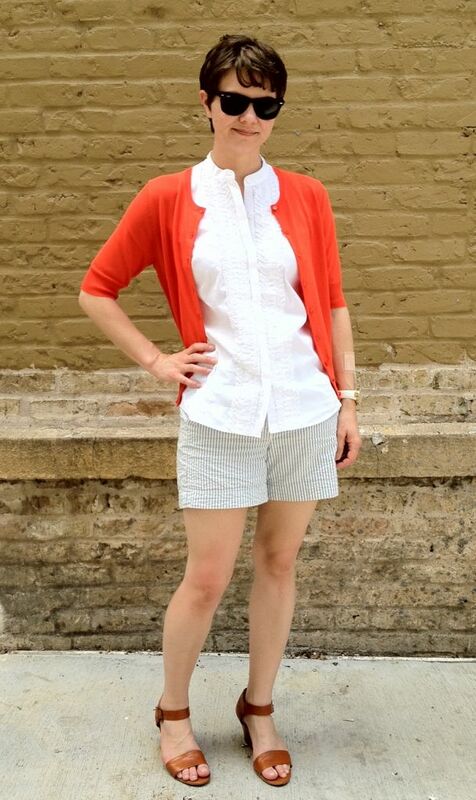 Here is an outfit I've worn several times over the summer. I usually like to mix and match and create completely new outfits, but this year I've found a few go-to outfits that I wear the exact same way every time. I copied the look out of the J. Crew catalog when I realized I had some of the same pieces in my wardrobe already. I know I've been mostly MIA on the forum since the end of July. I attended the writing conference in California and it was great! I felt very stylish and appropriate thanks to all your help in this thread. But when I got home I knew I had to get straight to work on writing, so I haven't been able to post as much as I'd like. I picked this gingham dress up on super sale from J. Crew right before conference and I really wanted to take it with me. I knew from online reviews that it might need some alteration because the bottom would probably be too big for me (I'm bigger on top than on bottom). I received the dress about a week before I was supposed to leave and sure enough, it was too big on bottom and around the waist. I rushed it to my tailor, who was recommended to me by Ironkurtin. They have been wonderful and always do a great job, but it takes them about 10 days to do an alteration for me because they also do wedding dresses and are very busy. Anyway, I took it in Tuesday and asked if they could have it done by Saturday (I left Sunday). They said yes, to come back Friday after 4PM. Hooray! I was so happy I was able to take my dress to conference and I wore it with the red shoes and white wrap sweater in picture #1 and the necklace in picture #2. The other pictures are how I plan to dress it down and wear it more casually (stolen, I mean inspired by the J. Crew catalog). I'm not sure how I feel about it with the denim jacket, so opinions on that would be appreciated. Thanks for reading this far! Comments and suggestions for other casual styling options welcome! I had my NAS pre-select appointment on Friday and it was mainly a bust. I ended up buying one bra, which was a duplicate of one I already own and like. I might buy the matching underwear after the sale goes live. It's been so hot here lately...I'm just not motivated to buy sweaters and boots and things that will moulder in my closet for months before I can wear them. And the watch selection at our Nordstrom was different than online. Even the one I had my eye on that I asked the salesperson to pull ended up being different (much more bling on the one at our store than the same model is showing online). Not sure what's going on there, but I decided that I will put off watch buying until after my trip and ask for one for my birthday. I have a large gold bracelet I can wear instead of the watch, and I think it will have the same kind of effect in accessorizing an outfit. It's been hot outside, but not unbearable (high 90s). I wanted to wear something comfortable and easy to wash since I knew we'd be outside in the grass. I'm still not completely unpacked, so I don't have access to a lot of my accessories right now. 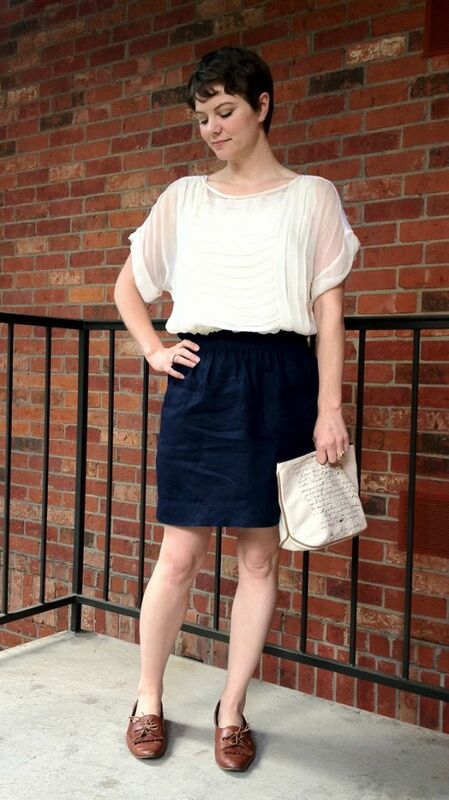 I wore this outfit to an afternoon tea my writing group hosted a few weeks ago. I got the bottoms during the Austin YLF outing. They were capris that I cut and folded to make them clamdiggers. Thanks to Debbie and Sarah for convincing me to pick these up! I was finally able to take an outfit photo yesterday. It's starting to get warmer here (high 80s-90s). 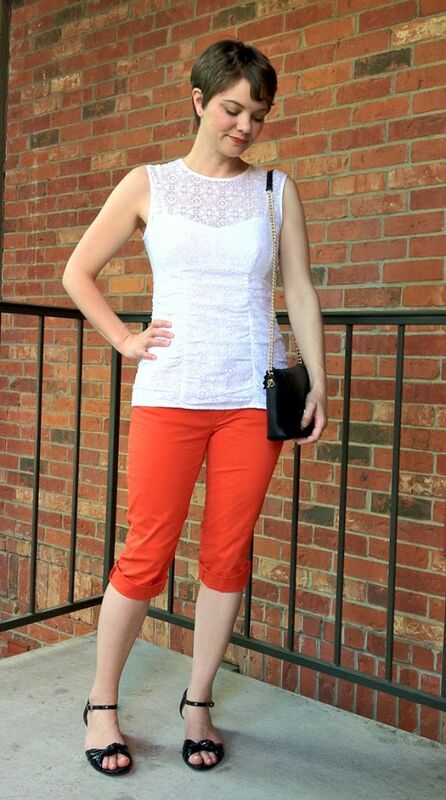 I wore this outfit to go see a movie at the Paramount Theater downtown, which is one of those old-fashioned theaters that used to stage plays but now they also show old films in the summer too. I went to with a friend and her husband and we sipped gin ricky's and watched "The Sting," then went to dinner afterwards. It was really fun! I picked up this tunic at TJ Maxx a few days ago. It was on the clearance rack and looked pretty dingy and wrinkled, but I figured for $15 it was worth taking home and seeing if I could clean it up. I like the pleats down the front and the drape. It reminds me of a blouse from the 1920s. P.S. I just got a new phone and the camera in it is supposed to be better than my point and click. I took this photo on the HD setting with my phone, so please let me know how the quality is for all of you, would you? I might be able to do some editing to make it better. Hi, I'm Ana! I'm a writer with a dressy aesthetic, but a casual lifestyle. Add in the sweltering humidity of Austin, Texas and well...let's just say I've got a bit of a fashion challenge on my hands. Stylewise, I'm always striving to hit that point where the three intersect.